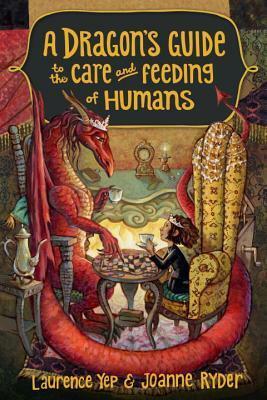 I knew I had to read A Dragon’s Guide to the Care and Feeding of Humans the moment I read about it in Publisher’s Weekly. Sadly, it isn’t available to order for my store yet, but I am hopeful that when it comes out in paperback I can get it to share with all my younger customers. Synopsis: Miss Drake is devastated when her pet, Fluffy, passes away and can’t imagine getting a new companion right away. So when Winnie shows up at her door the dragon tries to explain that she would much rather stay in with her tea and books. Of course, humans never know when to leave well enough alone, and soon Miss Drake is up to her wing-tips in trouble. Winnie and Miss Drake make an adorable pair. Although they drive each other crazy and can both be extremely stubborn, they obviously care for each other. As they learn to appreciate each others’ differences, you can see how their future relationship is going to develop. Miss Drake has obviously had a number of “pets” before, but this human seems more like a companion and friend. I like that Winnie is independent and strong-willed, and isn’t willing to just accept things at face value. My only problem with the book was the fact that Winnie’s mom has no problem with this woman/dragon just wandering off with her child. Miss Drake can change her form, so Winnie’s mom just assumes that this is a house guest/tenant. Apparently she was informed about Miss Drake before moving in, but she doesn’t even blink when her daughter goes off with a total stranger. Why are all parents in books THE WORST? I really hope this becomes a series, because I think there are a number of adventures waiting for this duo. The book is full of interesting and new magical creatures, which I found very appealing. I can’t wait to get a copy of this book into the hands of some young readers I know.